The digital release of Race Against the Sun will be through Pavement Entertainment. The physical album will be sold via the band’s website, www.dethonator.com. Details for Part Two of the album will be announced in late 2019. 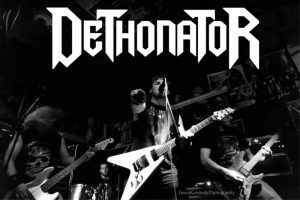 Originally forged in the East Midlands of England and now established in London, Dethonator is an exciting four-piece heavy metal band. Starting out as teens in the summer of 2002, Dethonator has honed its craft over a decade and a half. If Judas Priest define heavy metal, then Dethonator is damascus steel—metal forged true with myriad layers of influence drawn from the many stylistic paths explored by their forebears over the past half century. To accompany their new album, Dethonator is also releasing the official lyric video to “Pyroclastic,” a high energy heavy metal song straight from hell. The lyric video was produced by Very Metal. It provides fast-paced fiery visuals, as a volcano takes out an ancient society.